Facebook’s goal of tracking ads all the way through to a customer’s purchase at point-of-sale is getting a big boost today with a makeover of the Facebook Offers program. 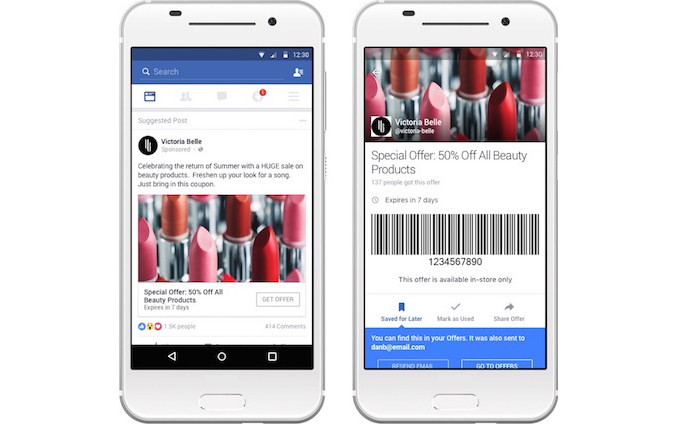 Now designed to be more mobile-friendly, Facebook is allowing businesses to create two kinds of offers – those customers can redeem online and those they redeem in-store – while also making it easier for customers to pull up the coupon they need at the register. Facebook Offers launched back in 2012 as a way for Facebook advertisers to reach customers through campaigns designed to tap into the social network’s viral effect – that is, Offers could potentially be exposed to a broader audience than targeted, thanks to people sharing the deal with their friends. Now, Facebook says it’s making it easier for advertisers to reach customers on mobile. Offers can be designed to be used online or at point-of-sale, and they can be shared either via an Offers ad or via the business’s Facebook Page. The ads will appear in the News Feed on both mobile and the web, and can be customized as other creatives can be – such as by using carousel ads, for example. Meanwhile, businesses can use the Offer Page Composer to share an Offer on their Facebook Page. For Page visitors, there will also now be a new “Offers” tab available so you can browse through the business’s past offers in a single location. This will make it easier to find the current coupons and discounts, without having to scroll down the Page to see what you may have missed. Of course, tracking an Offer’s redemption online is easy, and the number of claims will be available to businesses in the ads reporting product, says Facebook. The larger challenge, historically, has been connecting a Facebook ad to a real-world purchase. In the past, Facebook has done this by connecting advertisers with data provider partners, like Datalogix, Epsilon, Acxiom, and BlueKai to parse lists of consumers’ offline purchases. More recently, it announced partnerships with POS systems Square and Marketo that would help Facebook better understand when an ad led to purchase – or even a store visit, thanks to a feature that matches GPS, beacons, Wi-Fi, radio signals, and cell towers with a brick-and-mortar store’s coordinates. Today, Facebook is bringing a similar level of tracking in-house. From the new Offers bookmark, shoppers will be able to quickly pull up the discount and then show their phone at the register, where the business can scan the provided barcode or QR code. This definitively connects the Facebook ad to the purchase. Meanwhile, when shopping online, customers can easily copy the Offer code for use at checkout, and view the terms and conditions. The company says it’s now working on unique offer codes that allow advertisers to create specific offers for individuals, in order to prevent mass distribution, or select groups – like the business’s best customers, for example. Facebook also says it will remind people to use their Offers before they expire, and will be reminded on their next desktop visit about an Offer they claimed while on their phone. The online Offer ads are live now, while in-store ads will be available in the coming weeks, Facebook notes.